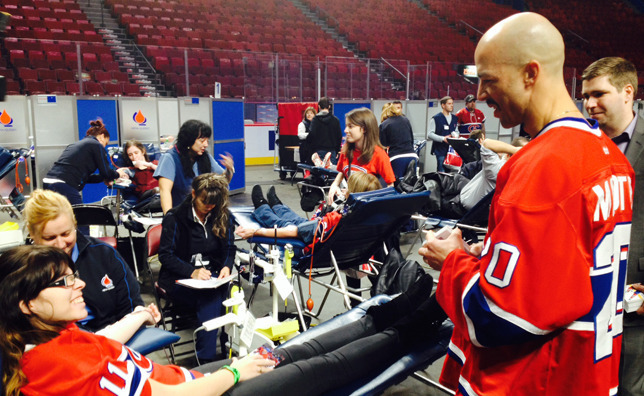 MONTREAL – Hundreds of fans took to the arena floor at the Bell Centre in conjunction with the Canadiens-evenko Blood Drive on Tuesday. Heeding Héma-Québec's call to make a difference by donating approximately ½ litre of blood, donors were also given the opportunity to meet and interact with Canadiens players, in addition to members of the coaching staff. Michel Therrien’s troops were pleased to spend time with donors, who came out in droves to support a worthy cause. While Subban is a Canadiens Blood Drive vet, Pierre-Alexandre Parenteau made his first appearance at the event since joining the Habs over the summer. The same can be said for the donors themselves, many of whom have a strong personal connection to blood drives like this one. Montreal Canadiens owner, president and CEO, Geoff Molson, shared similar thoughts on Tuesday afternoon. The Canadiens Blood Drive was initiated by Jean Beliveau and Claude Mouton back in 1981. According to Héma-Québec, it has helped save over 100,000 lives to date.